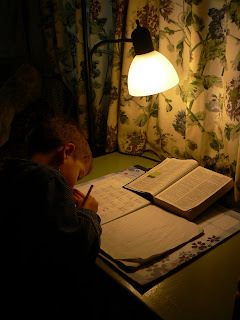 Here is Noah, soon to be seven, working on his Bible copy. Today, with a big smile, he informed me that he is copying about Cain and Abel. There are many benefits to introducing the Bible to children when they are young. We have been learning so much more about this with our youngest children. First of all, the Bible is true. We have always noticed with our children, they would to ask if a thing was true. When Zak was little, we had many children's books, many with animated teddy bears or other talking animals characters. They had what we considered good messages in them, about being kind, etc. However, we slowly phased many of these out, for the obvious reason, we didn't want something goofy to appear more interesting or fun than the Bible. That is, we didn't want to give the kids a taste or preference for what could be considered spiritual junk food. We wanted them to develop a taste for healthy food! We also phased out Bible story books, for the most part, especially those with "pictures" of Jesus. To some extent, books illustrating parables (such as the wise man built his house upon a rock) have been useful, but there is a limitation that illustrating a Bible story puts on things. And, there are benefits gained from the child listening attentively to the actual scriptures and processing what details are actually in the story. I guess, you know, more of your brain is involved in the process. Third, besides family Bible reading, we have started doing Bible reading during the Kindergarten/Preschool time with the younger boys. This can jump around to favorite stories (Jonah, Noah, creation, and recently Proverbs), and we repeat their favorites alot. We have seen this bear fruit with our reading students as they begin sounding out more words. If they are familiar with a passage or book, such as Jonah, then this gives them a little self-check as they are working through the words. For example, Susanna was working on Jonah, and since she's pretty familiar with hearing it, it helps her have a hint about some of the words, especially those that are tricky to sound out (for English isn't always very phonetic). Also, reading from the Bible, which has no pictures, eliminates some of the crazy guessing we used to see when they were reading their "Bob Books". (Mommy would have to cover the illustration, or they would give an alternate reading without trying to sound out any of the words on the page at all!) Yes, it's slower, and the child needs more assistance. But there seems to be much more satisfaction in the child when they can tell their siblings they read from their own Bible. And ultimately, this our goal anyway. So, we are still learning alot as we work with the younger children. The benefits to reading the Bible are limited if you don't DO what it says. And of course, there are plenty of times that God's Word can and should come up in our everyday conversations. We are thankful for what the Lord is teaching us. One of the girls was heard to have said that if/when she has a child, she will begin reading the Bible to him or her from the day of their birth!